I thought of all the compromises I’d negotiate as I ran toward the bus I certainly was missing. I’d realized I’d forgotten my wallet too late into my bus stop journey. After retrieving it, I thought of stopping to send correspondences with my status and apologies. Maybe what stopped me was not wanting to so easily be conquered by trivialities? I arrived at the bus stop just moments before my bus, and with something more! Was it upholding my own personal standards? It was certainly a sense of owning my mistakes in their entirety. When it is the fault of a bus delay, traffic accident, or something outside our usual control, there is less of a sense of personal shortcoming. Anyone would have encountered the same hurdle given the same situation. But a forgotten wallet, though ubiquitous enough that it’s happened in earnest to basically everyone, is still just an excuse. “Please accept that normally I am more responsible with my mornings.” “No, I didn’t oversleep.” “No, I’m not hungover.” The more you give into the weakness of excuses for yourself, the more likely you will be to allow others to make you weak. Maybe I knew there was still a chance? Maybe I would rather send those correspondences from the bus stop, not having preemptively assumed my weak defeat? Defeat is only true once we accept it! It’s not good to push too hard. My nose is running and it’s mostly due to allergies. There’s also the general sense that I’ve expended a tapped resource and so my body does as all tend to do and communicate that expenditure in the form of an inconvenience. Resting, inside, away from those rude allergens, is typically the best long-term cure for this, yet the dilemma here is that there’s no real short-term cure other than fresh air. Not really possible in the city. And yet, it’s a goal I can strive for, not just today on my precious down time, but going forward as well. For I have practiced and achieved a sense of personal responsibility that I could have easily give into and allowed to dictate my day. Instead, if I can control, to as best a degree as one can, my today, then I can control my future. I can say that in spite of losing nearly 15 minutes of time to running, I will not be late. Then, when I am, it isn’t because of some small object. Something bigger took me down! 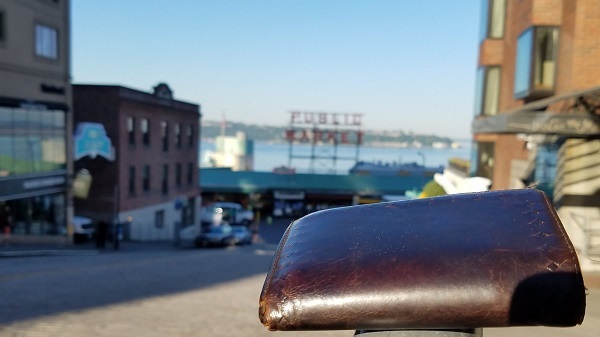 Photo: The troublemaker and the Pike Place Market sign.